Following our initial discussions, a Company Key will be created for the your delegates in order that they may complete our online Negotiation Diagnostic Profile™. One of the positive effects of this is the engendering of a sense of ownership and influence with regards the training solution. This in turn leads to greater acceptance and internalisation of the deliverables, rather than the program merely being something that senior management make compulsory. 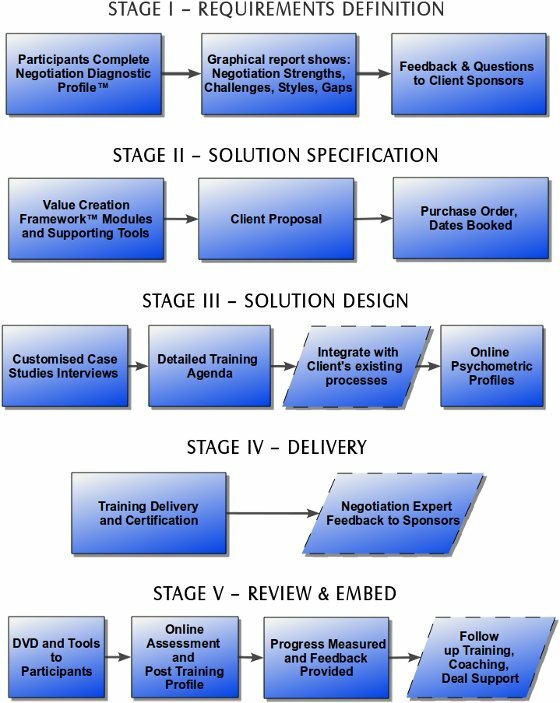 Results from the Negotiation Diagnostic Profile™ will be made available to the client via email in graphical form, and a follow up conversation to debrief on what we have discovered. We often uncover structural or other organisational symptoms that fall outside of the remit of negotiation collaboration. Whilst suggestions can be made to your organisation in these areas extraneous to negotiation, we prefer to focus our conversation on the negotiation opportunity at hand. After discussing the results with the client sponsor, and having our questions answered we will be in a position to start selecting the most relevant modules from our Value Creation Framework™. This approach enables us to customise the training agenda to include only those modules that are most relevant to the your organisation and that we believe will lead to the creation of long term commercial value. The appropriate level of depth will also be determined for each module. Depending on the level of negotiation capability required by your organisation, we will either proceed directly on to producing a proposal, or we will consult further in order to fully integrate our processes and supporting tools. After your sign-off on the solution (we will present our order form and standard terms and conditions) together with the your purchase order, we will be able to create a detailed training agenda and begin work on the creation of customised case studies. Case studies are customised to suit not only your industry, but also to accurately reflect the current detailed commercial challenges that negotiators face whilst negotiating for your organisation. For each case study we will require roughly 2 hours of time from one of your senior negotiators, in order to extract the relevant case study information. This interview is usually conducted over the phone. Should you wish to integrate our in-depth negotiation templates and tools from our Value Creation Framework™ into their existing internal negotiation preparation and review cycles, we would require additional consulting time. Delegates will be required to complete all relevant on-line thinking preference profiles in ample time prior to the training date. Delivery should preferably take place over consecutive days. Should the you require a staggered delivery, this can be facilitated. In order for our training to be successful, we ask that you ensure that as far as possible, delegates' attention is not being diverted by other pressing events or business. To this end we highly recommend that clients consider holding the training away from the main office - where e-mails, phone calls and meetings can divert attention. A report containing our consultant's detailed feedback on all delegates can be prepared for senior management. This specialist consultant report summarises each delegate's main areas of strength and also gives direction for future negotiation and related areas of development. At the end of the course, delegates who have fulfilled the attendance and participation requirements and have performed satisfactorily in their negotiations will be certified. This certification fulfils our training requirements, and is not final until such time as the delegate has passed their exam. Full certification is granted after a delegate completes their online examination. The exam is administered several weeks after the conclusion of the training to those delegates who have successfully achieved training certification. The passage of time between delivery and administration of the examination is important in affording delegates time to properly assimilate the learning, utilise the toolsets and try out the strategies in their commercial and other negotiations. Should a delegate fail their exam, they will be given the opportunity to be interviewed by a senior consultant and be coached on the questions they got wrong. This interview will include a Socratic or verbal examination. Coaching can be provided prior to the exam to any delegates who require assistance. You can elect to have a detailed measure of progress and gauge opinion using our Negotiation Diagnostic Profile™ at any date following the training. A follow-up training can be arranged to either cover further modules or to tackle further complex case studies. Case studies allow you to more objectively assess the real progress of delegates following the initial training. Case studies also provide delegates with the opportunity to achieve more practice in experimenting with the skills, strategies, tools and processes, where experiments and mistakes won't negatively impact on your commercial negotiations and reputation. Consultant's time can be reserved to provide either individual coaching or mentoring, and to assist in closing large or strategic deals.